In the photos shown, I substituted the recommended raspberries with blackberries. 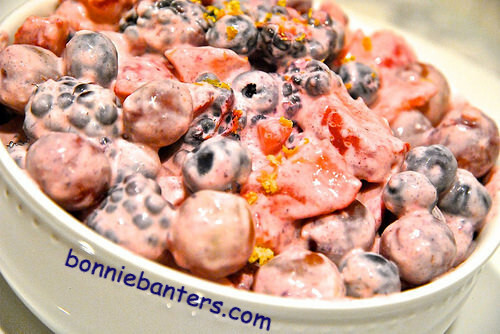 The first time I made it, I used the raspberries...either are wonderful in this salad. Also, I did not cut the grapes in half in these photos; as they were so small, plus it saved time. The grapes may absorb more of the dressing if you want to take the time to cut them in half, as I did the first time I made it. I used whipped clover honey in the dressing (which would also make an incredible fruit dip! ), as I love it and generally use it in recipes. Fresh lemon juice (about 1/2 of a medium to large lemon) is ideal, and just the small of amount of lemon zest suggested for garnish adds an unbelievable flavor...in my opinion, it makes the recipe! I did add fresh mint leaves to garnish my salad when I served it and wish I had not forgot to add it in the photos. The mint leaves do add a special touch. I made the dressing and prepped the fruit (keeping them separate) the day before I took to the family gathering and mixed all together right before I served the salad. This worked very well; and I recommend you do the same, to avoid a watery salad. To Party In Your Mouth! 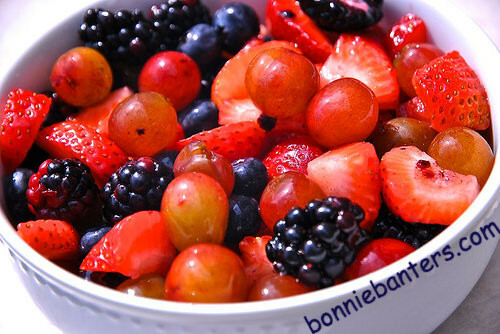 Enjoy a berry happy end of summer!